If you’re into woodworking, Work Sharp WS3000 is a thing you just gotta have! Why? Because it will make all of your woodwork tools razor-sharp! You can use it to sharpen chisels, lathe tools, plane irons, carving tools, spoke shaves, and so on. Check it out. The best thing is that this wood tool sharpener does all the work for you. Your sharpening task is just to place the tool in and Work Sharp WS3000 will do the rest. This sharpening machine is the most uniquely designed model among all the Work Sharp Knife Sharpeners. 1/5 HP motor – For a tool sharpener, this is a very powerful motor. With 1/5 HP, it’s capable of achieving the speed of 580 rounds per minute, which is more than enough for quickly sharpening any kind of woodworking tool. Angle settings – Another great thing about this sharpener is that it has precise angle settings, so there’s no need for any guesswork. You just need to choose the right angle settings for your tool – 20°, 25°, 30°, or 35°. Sharpening port – The sharpening port is wide enough to allow you to sharpen regular-size tools without any problems. In fact, you can sharpen any woodworking tool that has a blade that’s between 1/8 and 2 inches wide. Air-cooling – This sharpening tool has routed air flow in its engine, as well as a heat sink cooling technology, which ensures that it stays cool while working. In turn, this means that no damage can be made to the tools you’re sharpening. Instead, they get sharper, while staying strong. Special wheels – This sharpener comes with an Edge-Vision wheel. This allows you to see through the whole sharpening process to avoid excessive removal of metal. This feature is ideal for contoured tools sharpening. You’ll also get two tempered glass wheels (150mm) in the package. You’ll notice the tempered glass wheels are thick and solidly built so it’ll not wear down so easily. Basically, this means that you will be able to use them for years. Abrasive disks – The WS3000 includes 16 abrasives with different grits ranging from P80 to 3600 Micro-Mesh. Depending on which kind of woodworking tool you’re planning to sharpen, you need to choose the appropriate grit of abrasive. You can attach different grits of abrasives to both surfaces of the tempered glass wheels. That’ll allow you to switch from one sharpening task to another, without too much hassle. If you’ve ever tried to sharpen a woodworking tool, like a chisel for example, on a big sharpening wheel you know that it’s super difficult. Getting and maintaining the correct angle throughout the sharpening process is a big issue for inexperienced users. Work Sharp WS3000 is the most reliable woodworking tool. It has expansion capabilities too. Click on the image to check the review on Amazon. Imagine if you don’t do it the right way, not only will you fail to sharpen the tool properly, but you can even damage it. Or even worse, get yourself injured. Those things won’t bother you if you’ve Work Sharp WS3000. Unlike other models like the Work Sharp Tool & Knife Sharpener and the Ken Onion Edition, the WS3000 is not the typical handheld sharpener. It is supposed to sit on the workbench to maintain stability and accuracy for all your sharpening tasks. Update: More than 300 reviews on Amazon. Click here to read the reviews. First of all, it comes ready for use. So, after taking it out of the box, take the required self-sticking PSA abrasives (grits of P120, P400, P1000 and 3600) according to your sharpening needs and tape it to both surfaces of the tempered glass wheels. Fix it to the sharpener and start to operate it. The rotating disc on the top is designed to safely sharpen larger blades. It’s most suitable to flatten the back of the tools quickly and consistently. This machine also comes with an Edge-Vision wheel. Use it to your advantage for precision sharpening task. The Edge-Vision Wheel allows “see-through” of stock removal to avoid over grinding, especially for sharpening curved and specialty tools. Need to sharpen chisels and plane irons up to 2 inches without guesswork? The sharpening port underneath the wheel is so innovative you’ll surely appreciate this unique feature. This sharpener is extremely easy to use thanks to the fact that it comes with the built-in precision pre-set sharpening angles. You just need to pick one from 20, 25, 30, and 35 degrees and put the tool blade inside the sharpening port. The sharpener will then do its job and in a very short amount of time, your wood tool will be razor-sharp. Repairing damaged chisel is a breeze as it does not affect the steel temper with the patented air-cooled technology to allow higher rates of metal removal which maintaining its precision angle. It also does the blade cleaning job for you. The Work Sharp WS3000 has a lapping abrasive that scrapes off the metal burr and adds the final touch to the blade’s edge. The main reason why you’re likely to fall in love with this sharpener is that it’s super-easy to use. It’s also very efficient. That’s because the unique features of the Work Sharp WS3000 Wood Tool Sharpener can effectively sharpen whatever flat blades and contoured tools. It is designed for the serious woodworker to sharpen chisels, lathe tools, carving tools, plane irons, and other woodworking tools. Generally speaking, you can sharpen a wood tool in only a few minutes. Surely, it all depends on the quality and the thickness of the blade, but you definitely won’t spend too much time doing the sharpening work. Just like many of the top-rated electric knife sharpeners, this important feature of speed sharpening has been very well taken care of. The good things about Work Sharp WS3000 don’t end there. It’s a very sturdily-built sharpener, which doesn’t break easily. Even if you tried to break it, you would need to put a lot of effort into. That said, you can expect this sharpener to be your humble servant for many, many years. 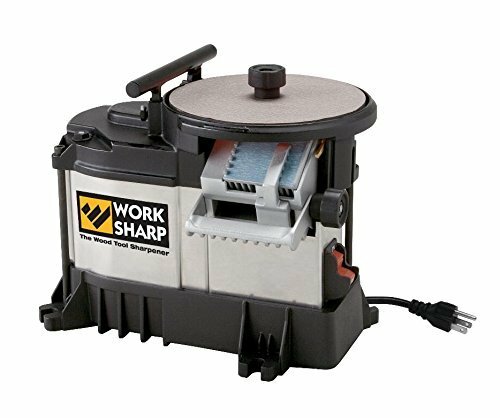 In fact, buying the Work Sharp WS3000 right now means that you probably won’t need another sharpener for all your woodworking tools in your lifetime. Speaking of buying it, there’s another reason why you ought to do it – it’s very affordable, especially when compared to other sharpening tools. Not to mention it comes with a 2-year warranty. So, are there any bad things about this sharpener? Some users claim that it’s not too convenient to use, especially when working with larger tools. However, in most cases, the tool is not to blame, but the users themselves. They just don’t know how to get the most out of it (see optional attachment below). As this machine weighs more than 15 pounds, it’s no way as portable as the Work Sharp Combo Knife Sharpener. Anyway, it’s supposed to be stationed on the workbench, right? 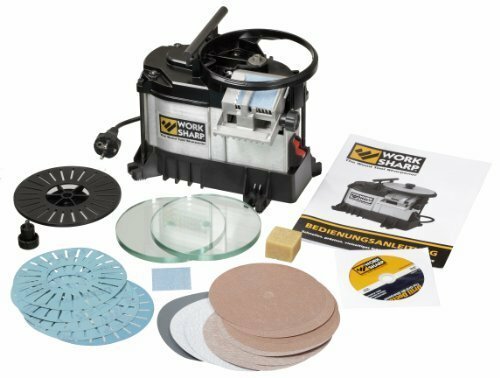 If you’re planning to use Work Sharp WS3000 to sharpen large woodworking tools, a wise thing to do is buy a Wide Blade Attachment or the Belt Sharpening System Attachment. Work Sharp WS3000 and the attachments work perfectly well. They’re manufactured by the same company, so it’s a perfect match. The real reason why you should get the Wide Blade Attachment is that it will enable you to sharpen the tools with blades of up to 3 inches wide. And the Belt System Attachment will allow you to sharpen kitchen knives, pocket knives, hunting knives, scissors, and serrated blades quickly and easily. To get the chisel fully sharpened and cut cleanly on wood without crushing it, you have to polish the back of the tool right up to the cutting edge. Many folks did not optimize this method and end up cutting like crappy. When you flatten the back of the chisel, also make sure the edge is sharp. Remember, the edge must be as sharp as possible to do a good job just like a razor-sharp knife for cutting vegetables, meat and tomatoes. Normally, it is very common to press the chisel against the top of the spinning disc with the fingers. Try not to do that. Keep your fingers away from the spinning disc to avoid injuries when you sharpen the tools. We suggest using a rubber cleaning block that came with the machine to press the chisel against the spinning disc during the sharpening process. Also, do not apply too much downward pressure on the tools as this will quickly heat up and remove too much metal unintentionally. Do it gently to safely sharpen any tool. Also, remember not to grind the metal in one shot without cooling it. It’s a best practice to grind the metal in short intervals. During the whole sharpening process, remove the tool away from the spinning disc for a few seconds before the next grinding interval. This will ensure everything is in control. It is advisable to wear safety glasses for any sharpening task. You may find it unnecessary or troublesome but who knows something may happen in a split second if you’re not careful or attentive enough. If you’re into woodworking, you shouldn’t think twice whether to buy this sharpener or not. Even if you’re just a hobbyist who doesn’t need to sharpen the woodworking tools too often, getting the Work Sharp WS3000 is definitely a good choice for now and future. After all, its price won’t ruin your budget. Surely, after reading this Work Sharp WS3000 review, you must think highly of this sharpener. If you wanna buy it, we say go for it! This sharpener will keep all of your woodworking tools razor-sharp. Furthermore, it’s made by a reputable American company with 40+ years of experience, so you can be sure it’s gonna serve you well for ages. And considering that the price of Work Sharp WS3000 is pretty reasonable, there really is no reason not to get it. Chosenz.com is a participant in the Amazon Services LLC Associates Program, an affiliate advertising program designed to provide a means for sites to earn advertising fees by advertising and linking to Amazon.com, Amazon.co.uk or Amazon.ca.